The Arterial Revascularisation Trial (ART) compares coronary artery bypass grafting with a single internal mammary artery (IMA) to surgery with bilateral internal mammary arteries. In this study the radial artery was mainly used as the additional graft. While the IMA has patency rates of up to 95% at 10 years there is conflicting data on the success of radial artery grafts. Chief investigator of the ART trial is Professor David Taggart. ART-Vascular is a sub-study of ART that invited 258 Oxford based patients undergoing cardiac surgery, to undergo further investigations that aims to explore whether biological factors might also have an important influence on the success of their bypass grafts after surgery. The inner lining of arteries are made up of endothelial cells which release substances that cause your artery to dilate. The measure of how well this mechanism works is called endothelial function and is potentially modifiable. Pre-operative tests were carried out to investigate endothelial function in the radial artery by non-invasive ultrasound (by flow mediated dilation) in combination with laboratory tests of vessel physiology to test the hypothesis that endothelial dysfunction is a key factor in early radial artery graft failure. -To investigate why some bypass grafts work better than others in the ART study. -To test the hypotheses that pre-operative measures of endothelial function of the radial artery predict early radial artery graft failure and cardiovascular outcome following coronary artery bypass grafting surgery. 258 patients undergoing coronary artery bypass grafting surgery at the John Radcliffe Hospital, Oxford were enrolled to the study. The study is no longer recruiting. Data collection continues through access to patient’s medical records, extracting data from both the local Hospital archive and the NHS Digital records. Samples are still being analysed, and new scientific results continue to be presented in scientific meetings and published in scientific publications. 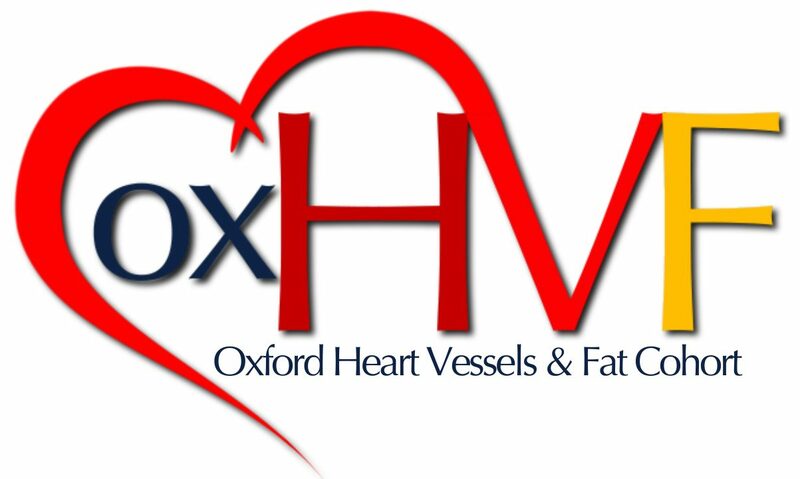 As this study is part of the Oxford Heart Vessels Fat (Ox-HVF) cohort, its results are interpreted together with the findings of other Ox-HVF projects. Ox-HVF is a cluster of clinical studies that provide synergistic results allowing the deployment of a multi-level strategy to understand the mechanisms of cardiovascular disease. This adds value to the research results and potentially may allow translation of the findings into clinical applications. Study Visits: Study participants had non-invasive, ultrasound assessment of the radial artery’s endothelial function before surgery and surplus segments of the vessels used for bypass grafting were collected for laboratory tests. 60 patients were invited back 9 months after surgery for a follow up angiography to assess the grafts’ patency. Organising and Research Funding: The study is organised by the Department of Cardiothoracic Surgery and Department of Cardiology at the John Radcliffe hospital and the University of Oxford. The study is funded by the British Heart Foundation, the Medical Research Council and the European Commission. Study Approval: Ethical Approval was provided following review by the Division of Cardiovascular Medicine (University of Oxford) and the Northern and Yorkshire Multi-Centre Research Ethics Committee (Reference MREC/04/3/006). Document version 1.0 Sept 2016. Announcement 09/1/2018: Following a recent study amendment, we would like to post a link to the latest study newsletter that includes information about the study, the study outcomes and an update to the data processing activities. All participants will receive a copy of this newsletter in the post in due course. If you have any further questions or queries please do not hesitate to contact us via the ‘Contact Us/Comments’ box or using the contact information in the newsletter. Newsletter link: Newsletter ART-Vascular 23.08.2017. Announcement 25/5/2016: We would like to inform our study participants that that since April 2014 the chief investigator of ART-Vascular sub-study has changed (from Prof D Taggart to Prof C Antoniades). The new chief investigator can be contacted either directly by telephone (+441865228340), by mail (West Wing level 6, John Radcliffe Hospital, Oxford University Hospital NHS Foundation Trust, Headley Way OX3 9DU, Oxford), by e-mail: antoniad@well.ox.ac.uk or by using the online form found in this website. Announcement 25/8/2016: In the original study documents and consent form (clause 4) we state that “I give permission for a member of the research team to look at my medical records to get information relevant to the research study. I understand that the information will be kept confidential”. This means that to keep your research records up to date throughout the duration of the study, we will send your NHS number and/or Date of Birth to the Oxford University Hospitals services and/or the NHS Digital who will link hospital admissions information to individual participants within the study. Then the information will be returned to us with data about any health outcomes. NHS Digital will also link your NHS Number and/or Date of Birth to civil registration data from the Office for National Statistics (ONS) which provides information regarding mortality of participants over the time period of this research. All personal information exchanged between NHS Digital is protected and encrypted in line with strict regulations and codes of practice that ensure high security standards. Choudhary BP, Antoniades C, Brading AF, Galione A, Channon K, Taggart DP. Diabetes mellitus as a predictor for radial artery vasoreactivity in patients undergoing coronary artery bypass grafting. J Am Coll Cardiol 2007;50:1047-53.